Trim the fennel by slicing its very base off and cutting back the tops. If the outer leaf is a little tired you can remove this. You can save this and use in your stocks. Cut each fennel bulb into 8 – 10 wedges. Depending on their size. 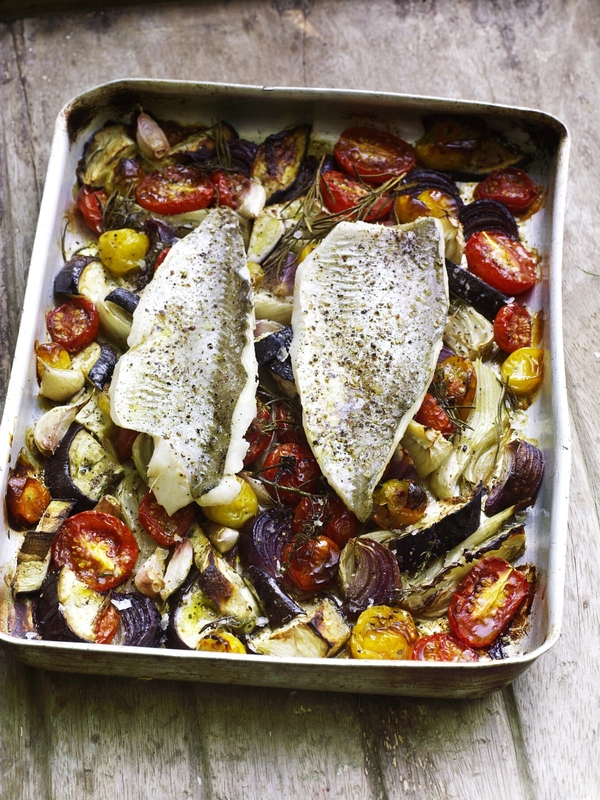 Scatter the fennel out over a large roasting tray. Halve any larger tomatoes and add these. Little ones can be left whole. Slice the Aubergine in half from top to tale then into quarters. Cut across the lengths to give you nice chunks. Throw these in to the tin as wel, along with the garlic cloves and red onion wedges and all the herbs. Don’t bother picking the leaves off, just throw in the whole stems. Trickle with the olive oil and season well with salt and pepper. Place the tray in the hot oven and cook for about 1 hour. You want everything to be blistered and soft. Remove the tray from the oven, season the Pollack fillets well all over with salt and pepper and trickle with a little more olive oil. Lay, skin side up, on top of the roast vegetables. Return to the oven for 15 minutes or until the Pollack fillet is just cooked through. Remove and serve straight away.